Capital of one of the Canaanitish kings conquered by Joshua; assigned to Manasseh (Josh. xii. 21, xvii. 11; I Chron. vii. 29). Its Canaanitish inhabitants were only put to tribute, not driven out (Josh. xvii. 12-13; Judges i. 27-28). Megiddo is repeatedly referred to in Biblical history. It is mentioned in connection with Baana, one of Solomon's commissariat officers, who had to provision the king's household for one month in the year. Its fortifications, which were of ancient date (being mentioned in the inscription of Thothmes III. ), were restored by Solomon (I Kings iv. 12, ix. 15). Ahaziah is said (II Kings ix. 27) to have died at Megiddo after he had escaped from Jehu; but in II Chron. xxii. 9 it is said that Ahaziah was found in Samaria, taken to Jehun, and slain. The most memorable occurrence connected with the city was the battle there or in the valley of Megiddo, between Pharaoh-nechoh and Josiah, in which the latter was slain (II Kings xxiii. 29-30; II Chron. xxxv. 22); "the mourning of Hadadrimmon in the valley of Megiddon" may have been on account of this battle (Zech. xii. 11; see Hadad). The same battle is mentioned by Herodotus (ii. 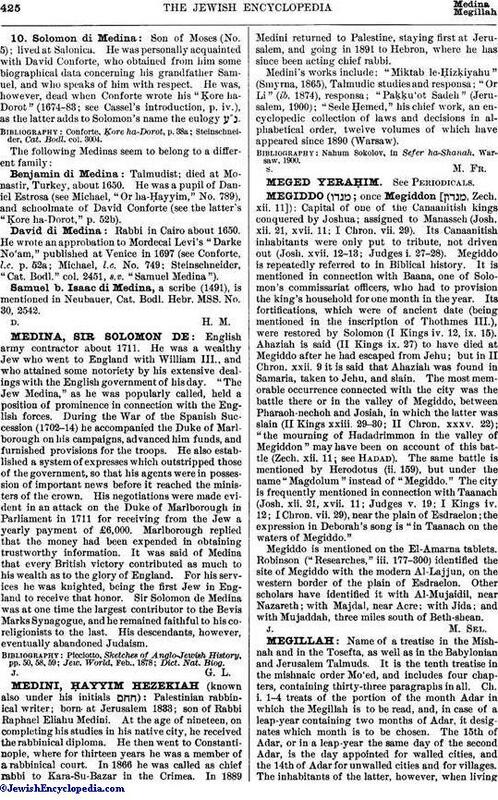 159), but under the name "Magdolum" instead of "Megiddo." The city is frequently mentioned in connection with Taanach (Josh. xii. 21, xvii. 11; Judges v. 19; I Kings iv. 12; I Chron. vii. 29), near the plain of Esdraelon; the expression in Deborah's song is "in Taanach on the waters of Megiddo." Megiddo is mentioned on the El-Amarna tablets. Robinson ("Researches," iii. 177-300) identified the site of Megiddo with the modern Al-Lajjun, on the western border of the plain of Esdraelon. Other scholars have identified it with Al-Mujaidil, near Nazareth; with Majdal, near Acre; with Jida; and with Mujaddah, three miles south of Beth-shean.